Switzerland is publishing Balance of Trade and the US will release Existing Home Sales and Chicago Fed National Activity Index. The support rests at 0.99120 with resistance at 0.99420 which both lines are above the weekly pivot point at 0.99060. The EMA of 10 is moving with bullish bias in the ascendant channel and it is located above the EMA of 200 and below the EMA of 100. The RSI is moving on the 50 level, the MACD line is above the signal line in the positive territory and the Stochastic is moving in high ranges. The ADX is not showing any clear signals. The price is in the Ichimoku Cloud and above the Chinkou Span. The Tenkan-sen is showing an upward trend while the Kijun-sen is showing a horizontal trend. The pair is trying to go high towards 1.00 area but it seems to be too difficult. 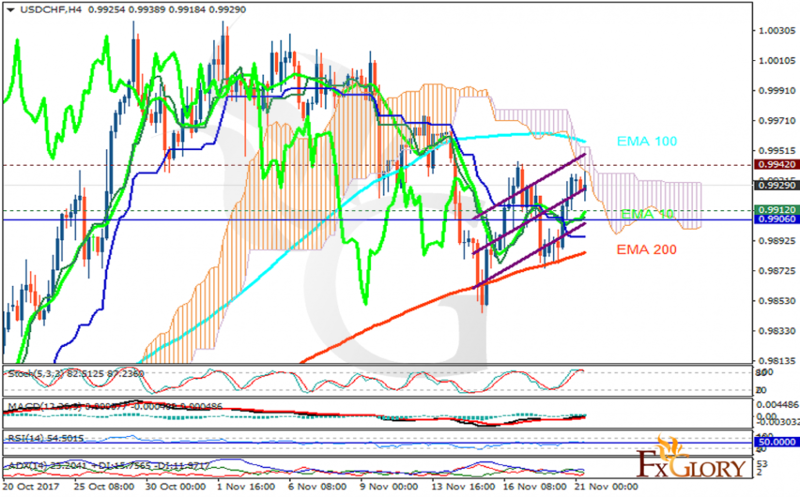 At the moment the resistance area is too strong to be broken therefore short positions are recommended towards 0.9847.